Next session begins May 6​th! 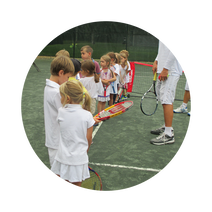 Vineyard Family Tennis offers a complete Junior Development Program for children ages 3-18. ​We also offer an Advanced Training Program. We provide a fun, safe and always positive environment for kids to learn and develop a love for the game. The Junior Development Program (JDP) has introduced thousands of island kids to the game of tennis. Our Goal is to provide a solid foundation of tennis fundamentals in a challenging and fun environment. This program is designed to follow the USTA pathway and guidelines. We will be using the age appropriate, USTA approved tennis balls and court dimensions. An introduction to tennis for our youngest players. Hand-eye coordination, basic movements, fun & games are used to build skills. Low compression balls and smaller courts help children to achieve ​early success.